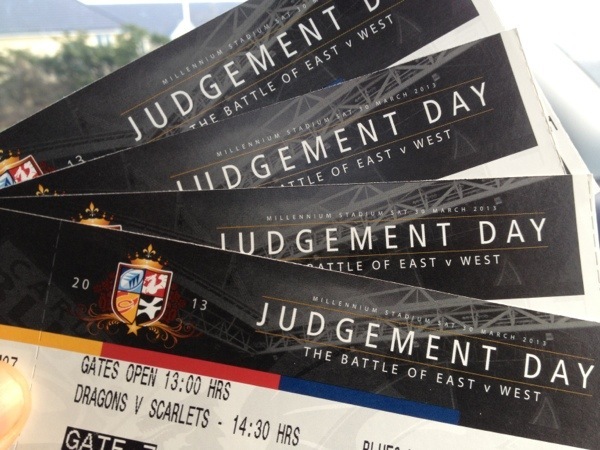 Judgement Day, no not the end of the world, the second coming or day of reckoning or a Terminator movie – a back to back double header of Welsh rugby in the Millennium Stadium in Cardiff. Having the chance to take my boy to his first rugby game, and it being in the home of Welsh rugby and the best rugby stadium in the country (in my opinion) for a bargain price was a deal I couldn’t pass on. A few weeks back, when Wales won the 6 nations I bought 4 tickets for us and my Mum and Dad. The idea was a bit of bonding and a test to see if he would like to go to an international. I think it worked. We only watched the second game – Ospreys v Blues – which kicked off with a fantastic Blues try scored by Welsh ace and hopefully British Lions fullback Leigh Halfpenny. The Ospreys went on to win but it was a great game with an excellent display of rugby. Long day though as we caught the train from Chippenham to Cardiff (and back) which took a while with a change in Bristol. Return journey was marred somewhat by a train full of drunk Spurs fans on their way back from a win at Swansea, only saving grace was they were in a good mood!